All I can say to the lovely Carly Heitlinger is thank you, thank you, thank you. And to all the new followers who checked out my blog yesterday, as well as all the new instagram followers – I am so thrilled that you found me! I really hope you stick around, and enjoy! This lovely lady has been blowing up on my Pinterest feed lately, and I absolutely loved her striped dress with the cutouts…truthfully I love cutouts in general, but I can’t comfortably traipse around bra-less and stay sassy about it…so I just don’t. Any ideas as to who she is or where she’s from? I keep tracing her back to Lauren Conrad’s blog on what to wear for summer. Everyone have a lovely weekend, mine will be full of capoeira, Brazilian food, trying to understand Portuguese and playing in the sun! This entry was posted on Friday, July 19th, 2013 at 4:00 am. 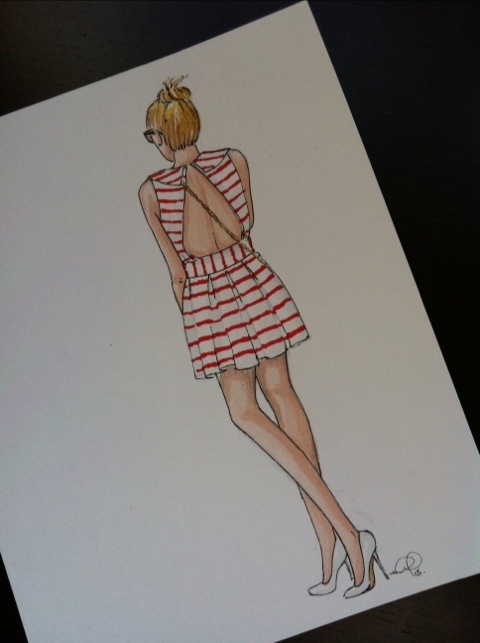 It is filed under General Musings, Ladies and tagged with Design by Streetlight, fashion illustration, fashion sketch, Pinterest, prisma markers, watercolour, yyc blogs. You can follow any responses to this entry through the RSS 2.0 feed.